We believe that some of you’re looking for this new features on LightSwitch 2013. We also support the latest Visual Studio LightSwitch 2013. You can take a look our hosting plan. 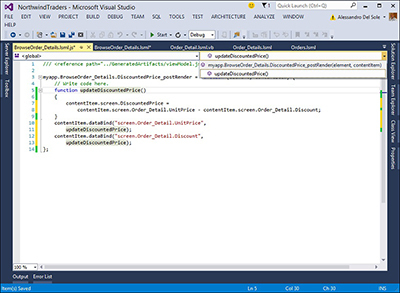 In today post I will show what’s new on Visual Studio LightSwitch 2013. A LightSwitch solution is composed of a server-side project based on ASP.NET and client projects based on either Silverlight (desktop), the new HTML client, or both. Until Visual Studio 2012 Update 3 (the latest update available when this article was written), the server project targeted .NET Framework 4.0. 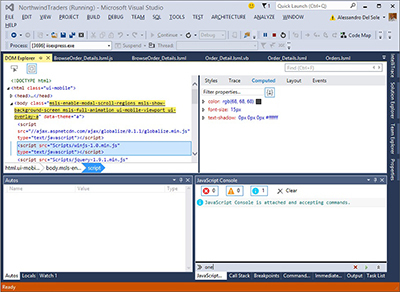 In Visual Studio 2013, the server project targets .NET Framework 4.5, enabling developers to take advantage of all the benefits of the latest version of ASP.NET and the .NET platform. There are many important changes in how LightSwitch projects are created and structured in Visual Studio 2013. The first important change is that every screen and every table is now represented by a file with the .lsml extension. These files are based on the XML markup language, and they make it easier to give projects a better organization. The new project structure also affects Solution Explorer in other areas. Visual Studio 2013 no longer offers Logical view and File view; you simply have the usual classic view of any kind of project you can open in Visual Studio. This change makes the LightSwitch development environment even simpler and provides a more logical approach. You can compare the new view to an extended File view. 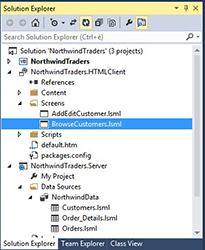 You also can take advantage of all the best tools offered by Solution Explorer since Visual Studio 2012 (a blog post on MSDN explains the details), such as search, scoping, and duplicate views. Another important improvement thanks to the new project structure affects team development. If you've had a chance to work with Team Foundation Server and source control over a LightSwitch application, you know how painful merging changes can be. In previous versions of LightSwitch, not all elements in the solution were managed by the source control engine. Now that everything is basically a file, every element is added to source control, allowing Team Foundation Server to manage the application changes correctly, thereby enabling team members to be more productive and efficient. Navigation buttons are available on the left end of the standard toolbar. With these buttons, you can easily go back and forward to elements you worked with previously. The Related Items drop-down list, available at the upper-right corner of any designer allows for easy navigation to screens, entities, and queries that have a relationship with the item you're currently viewing. One of the biggest limitations in previous editions of the IDE in LightSwitch was the inability to open multiple designers concurrently. This feature was requested frequently, as you often need to copy-and-paste items from one screen or table to another. Another great new improvement in the coding experience is the new auto brace complete. With this feature, Visual Studio 2013 automatically adds closing quotes, parentheses, brackets, and braces for you as you type code. When you create tables in a LightSwitch application, a SQL Server database (the intrinsic database) is created for you. 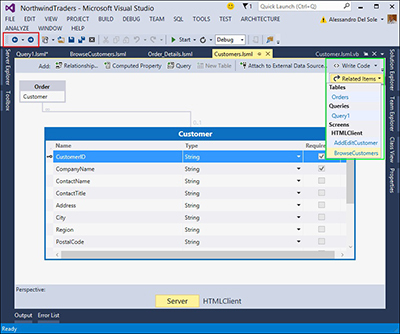 Then you can publish the database along with the application via the deployment wizard or with SQL scripts. Visual Studio 2013 brings an interesting new opportunity: You can link the intrinsic database to a SQL Server database project. This feature opens an incredible number of scenarios, such as writing custom scripts or adding stored procedures into the intrinsic database. Looking forward to try this new feature? Please check http://www.hostforlife.eu. We have offered the latest Visual Studio 2013 hosting on our hosting environment. Europe Crystal Report Hosting :: Crystal Report Show Blank Report, How to Resolve It? I know some of you will receive strange error on Crystal Report. It is working fine on your local computer but when you hosted it, and upload it to server, it doesn’t show anything, means blank site. Hmm…. How to solve this problem? Maybe this tutorial can get help you out. I had wired up a Crystal Report through a Web Form (actually embedded within an ASP.NET MVC Web Application) and loaded through the CrystalReportViewer across an ADO.NET DataSet. All was merry on my development machine, the report loaded fine with no problems. However, when deploying to our live server which was setup with the Crystal Reports Re-distributable Package for .NET Deployment, it was a different story. Well for me, creating the application as a .NET application in IIS, was not my issue, this had already been done. The error after a bit of fiddling, I actually found out, was due to that Crystal Reports-issued Web.config mentioned in the exception (c:\inetpub\wwwroot\aspnet_client\system_web\2_0_50727\crystalreportviewers12\Web.config). It was conflicting with my application. After spending some time with this file, I couldn’t get the error message to budge. So I took easy street, a good ‘ole rename. I humbly decided I did not need this file after looking through the properties, there were no mission-critical properties relevant to my app in there, so click, rename, voila, report online. Hope this was your problem. In this tutorial, I will show you how to deploy Umbraco website on our shared hosting environment. Easy and faster. First, you need to create blank SQL database. 2. Open Database Explorer (View -> Database Explorer) (in Visual Studio 2010 you will open “Server Explorer”). 3. The Database Explorer should show up on the right side of the IDE. 4. Right click Data Connections and select Add Connection. 5. Enter the server name in the first text box (type the name of your local SQL Server). 7. In Database Explorer you will see your local database. Right click on it and choose Publish to Provider. To generate the script that will create the backup of your database follow the steps listed below. 1. Click “Next” on the welcome screen of Publishing Wizard. 1. Open your database in SQL Server Management Studio 2008. 2. Click File/Open/File and navigate to the SQL script you just created from your SQL Server. 5. Click the “Execute” button. It creates all tables exactly the same as you have in your local DB.